Luminizers and highlighters have become the norm these days in the makeup world. You cannot have your regular makeup routine without using one of these items in your cosmetic routine because honestly, without contouring and highlighting, your face just is not the same. It is flat and dull, without liviliness and brightness to the face. IT Cosmetics has one of the perfect luminizing powders available for highlighting the face. It is called Hello Light Anti-Aging Radiance Powder Luminizer. This product helps you achieve a beautiful, lit-from-within complexion with this innovative, anti-aging powder luminizer. Loaded with skin-loving ingredients including peptides, hydrolyzed collagen and real silk to glide effortlessly over lines and wrinkles, the hydrating formula utilizes proprietary Drops of Light Technology™, a revolutionary, radiance-boosting complex that harnesses light-mimicking, optical-blurring liquid crystals for your most flawless, natural-looking glow. Apply this powder onto your cheekbones, brow bones, the center of the forehead, inner corners of eyes, and down the center of your nose, anywhere you wish to enhance and highlight! Developed with plastic surgeons, this talc-free powder illuminates without glitter or shimmer, and works beautifully on bare skin or over your favorite foundation. It brightens, hydrates and awakens your skin without settling into lines and wrinkles and one universal shade looks flawless on all skin types and tones. To Apply: Using your favorite IT Cosmetics brush, apply to the areas of your face and décolleté you wish to appear lifted or add light to, including cheekbones, the center of the forehead, inner corner of the eyes, above the brows, down the center of the nose, on the chin and on the clavicles. You will achieve a lit-from-within glow. 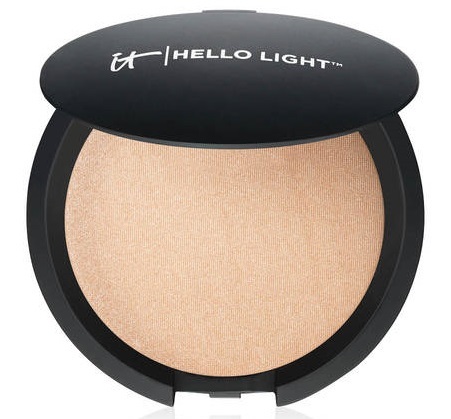 Achieve a gorgeous head-to-toe glow with Hello Light Anti-Aging Radiance Powder Luminizer. If you’re wearing a low-cut or strapless dress, swirl your Heavenly Luxe™ Angled Radiance Brush #10 into the compact, then dust onto your décolleté to make your clavicles look more pronounced and create the appearance of a slimmer frame. You can also apply this powder luminizer to the top of your shoulders and down the center of your legs to make them appear longer! I like that this product is not overly glimmery or shimmery. It has just enough glow in it to give your skin that lit-from-within glow. It is easy to apply and gives skin radiance that may be missing from the skin. If your skin looks dull or is in need of a boost, this would be the perfect powder to boost your skin. I think it is being phased out at the moment, so be sure to get ahold of it now, while it is still in stock. They might be reformulating it though. I think it is worth taking a look at and getting to know because a product that is like this doesn't come around often. Most products have too much shimmer in them and this doesn't and that is what makes it so special. IT Cosmetics Hello Light Anti-Aging Radiance Powder Luminizer retails for $20.00 and can be purchased online at www.itcosmetics.com and at www.ulta.com, www.qvc.com,www.sephora.com and anywhere IT Cosmetics is sold. Like IT Cosmetics on Facebook:https://www.facebook.com/itcosmetics; Follow IT Cosmetics on Twitter:@itcosmetics; Follow IT Cosmetics on Snapchat:https://www.snapchat.com/add/it_cosmetics; Follow IT Cosmetics on Pinterest:http://www.pinterest.com/itcosmetics/; Follow IT Cosmetics on Instagram:https://www.instagram.com/itcosmetics/ and Subscribe to IT Cosmetics on YouTube: https://www.youtube.com/user/itcosmetics.